1975 - making it the oldest established christmas cracker company in the UK. inside - oh, and of course, the corniest jokes that can be found! Would you like to learn more about English Christmas Crackers? will provide hours of fun! in addition to the windup Penguin gift. Meet these little Penguins up close! 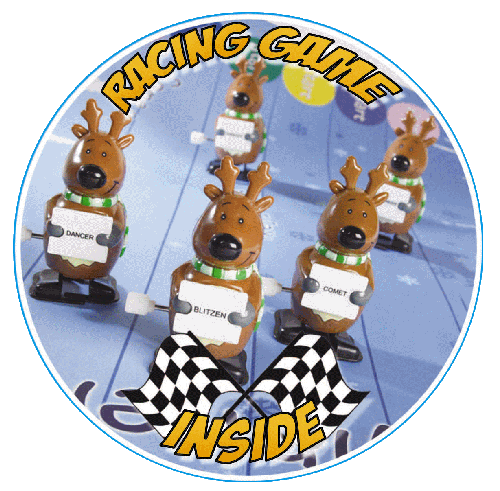 Introduced in 2014, each Racing Glitter Reindeer Party Cracker includes one of Santa's Reindeer - a windup toy ready to outrace the other Reindeer to the finish line! These larger, regal crackers are part of Robin Reed's Specialty Collection - each cracker contains a snap, joke, party hat in addition to the windup Reindeer gift. Box of 6 Crackers - 13 inches each (33cm) Imported from England by Robin Reed Specialty Collection - 2014 Introduction Replaces RR71201 Reindeer Games - 2012 Meet the Racing Contestants! In Stock! New for 2013, each Penguin Racing Game Party Cracker contains a crazy wind-up Penguin to race - Each one comes with a different colored bow tie to help clarify the winner each time! These little fellows will provide hours of fun! These larger, regal crackers are part of Robin Reed's Classic Collection - each cracker contains a snap, joke, party hat in addition to the windup Penguin gift. Box of 6 Crackers - 12-3/4 inches each Imported from England by Robin Reed Classic Collection - 2013 Introduction Meet these little Penguins up close! New for 2015, each Snowman Racing Game Party Cracker contains a crazy wind-up Snowman to race - Each one comes with a different colored hat & scarf to help clarify the winner each time! These little fellows will provide hours of fun! 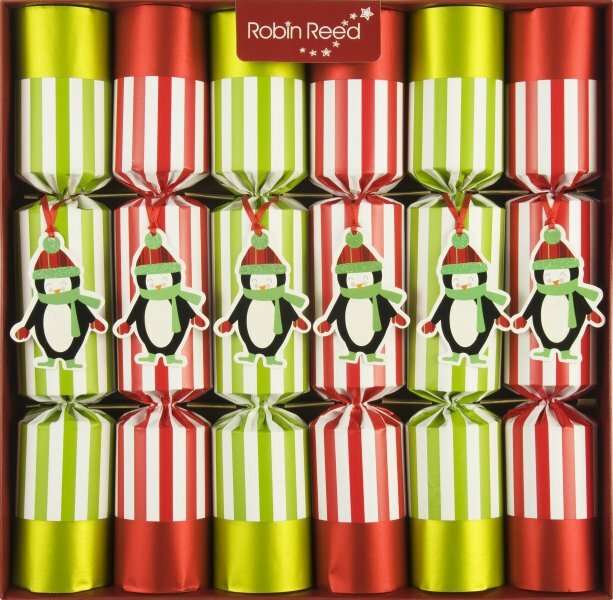 These larger, regal crackers are part of Robin Reed's Classic Collection - each cracker contains a snap, joke, party hat in addition to the windup Penguin gift. New for 2017, each Quacker Racing Game Party Cracker contains a crazy wind-up Yellow Duck to race - Each one comes with a different colored scarf to help clarify the winner each time! These little fellows will provide hours of fun! These larger, regal crackers are part of Robin Reed's Classic Collection - each cracker contains a snap, joke, party hat in addition to the windup Penguin gift. Box of 6 Crackers - 13 inches (33,0 cm) each Imported from England by Robin Reed Classic Collection - 2017 Introduction Click for Enlarged View of Contents New 2017 Introduction - Now in Stock! Similar to the Concerto crackers, but these oversized crackers contain not only a hat and a joke, but a different musical note handbell that allows you to create your own musical band. By using the music we have included, you can play both every day and Christmas songs. An unforgettable occasion with fun and music! As seen in the Saks 5th Avenue catalog! Box of 8 Crackers - 13-7/8 inches each Imported from England by Robin Reed Each Cracker: 2-3/8 x 13-7/8 Inches Click here to view contents in detail.